Southern as Biscuits: All about the buns: Hot Cross Buns! All about the buns: Hot Cross Buns! Give them to your sons!" 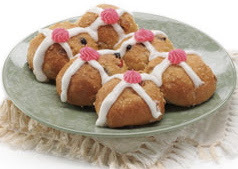 According to the wisdom of Wiki, in many historically Christian countries, buns are traditionally eaten hot or toasted on Good Friday, with the cross standing as a symbol of the Crucifixion of Christ. Easter sugar cookies in pastel hues. I tend to learn new stuff from your blog...all the time! Happy Easter, my friend!